In case you’ve been wondering, it’s pronounced Antee’ga! Antigua and Barbuda are located in the centre of the Leeward Islands. Visitors to this unique island will be impressed by the historical buildings and fortifications of English Harbour and Nelson’s Dockyard National Park which once housed the British fleet. With 108 square miles, Antigua is a relatively large island. It’s also different from some of its neighbours in that it boasts a peak elevation of a respectable 1,319 ft. With annual rainfall of just 45 inches, Antigua is the sunniest of the Leeward Islands. 30 miles due north lies Barbuda, a low lying coral island of just 68 square miles. The small island nature preserve of Redondo is also included in the nation, but is uninhabited and just 0.6 square miles! The Siboney people were the earliest known inhabitants of the islands, with sites dating to 2400 BC. The Arawaks and then the Caribs made Antigua their home before English settlers from St. Kitts finally established a community in the early 1600s. In the late 1600s the islands became a centre for sugar cultivation. Eventually Antigua and Barbuda became an important strategic point, and was known as the Gateway to the Caribbean. British Naval facilities were installed to enforce shipping laws. Antigua was the first island to enact emancipation in 1834, and a yearly Carnival takes place to celebrate the event. The Eastern Caribbean Dollar is the official currency, but the US Dollar is widely accepted. To find Antigua villa rentals by owner, for your next holiday, simply select Antigua and Barbuda as the destination in the “BROWSE BY” tool bar towards the top of the page. If you have set vacation dates use the “AVAILABILITY SEARCH” box, which blends in/out to the right of the slideshow. 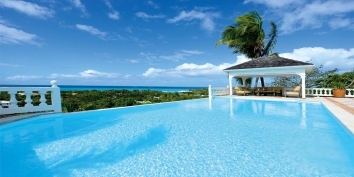 Alternatively, you can simply browse through the following list of Antigua villa rentals by owner. 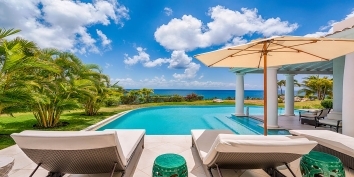 Villa Azura occupies approximately 1.5 acres of land close to Long Bay on the peaceful and unspoilt east coast of Antigua. This beautiful Antigua villa rental has 3 bedrooms, 3.5 bathrooms, infinity edge swimming pool and is surrounded by landscaped, tropical gardens. Villa Azura is located on a small cliff with spectacular views of the Atlantic Ocean from every room. 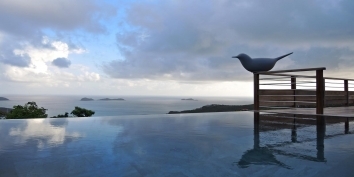 Find out more about Villa Azura, Long Bay, Antigua, Antigua and Barbuda. Villa H is located on the unspoiled east coast of the island of Antigua, one of the most exclusive destinations in the Caribbean. Standing atop a slightly elevated headland on the edge of (and with private access to) a tranquil, coral reef-protected, turquoise bay, this Antigua villa rental has a commanding panoramic view of the Indian Town National Park promontory, a protected area of exceptional natural beauty, and the infinite horizon of the Atlantic Ocean beyond. 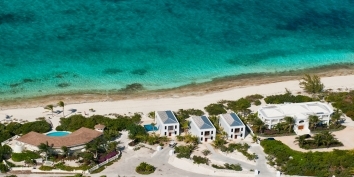 Find out more about Villa H, Indian Town Point, Antigua, Antigua and Barbuda. 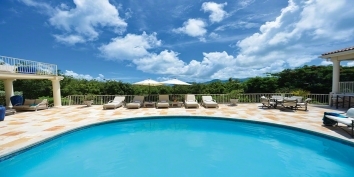 The Carib House, Turtle Bay, Falmouth, Antigua is set in over 2 acres of lush, tropical gardens. The airy luxurious Caribbean colonial style villa can accommodate groups of up to 10 persons comfortably. Comprising a total of five generous double bedrooms, all screened and with ceiling fans, our luxury villa can be rented as a whole, or as a 3 or 4 bedroom villa. Find out more about The Carib House, Turtle Bay, Falmouth, Antigua and Barbuda. ZANDOLI is a spacious, 3 bedroom, 3.5 bathroom, wooden house on Pigeon Beach Road, Antigua. Standing on a gently sloping hillside within the national parkland of historic English Harbour and Nelson's Dockyard, the lovely sandy beach at Pigeon Point (voted one of the ten best beaches in the Caribbean) is just 3 minutes walk away. This Antigua villa rental is beautifully designed and built in traditional Caribbean style, it has painted Jalousie wooden shuttered doors and windows to catch the breeze, ceiling fans and large shady verandas with south westerly sunset views across Falmouth Harbour towards Rendezvous Bay. Find out more about Zandoli, English Harbour, Antigua, Antigua and Barbuda. Is your Antigua and Barbuda villa rental already unique on CARIBIQUE? If not, find out how to list your Caribbean villa now!